United Check Cashing address, phone, website, hours of operation, and more. 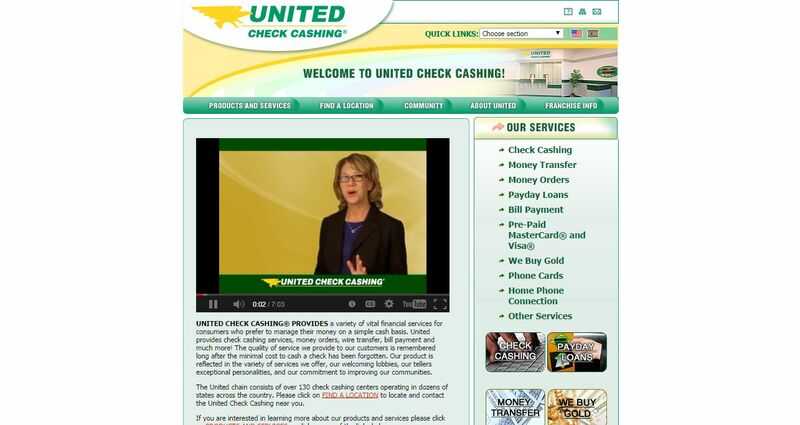 United Check Cashing is a pioneer in the check-cashing industry. Founded in 1977 in Philadelphia, its owners operated several check-cashing centers until they began franchising their business concept in 1992 and formed United Financial Services Group, Inc. Since then, United’s proven system has shown hundreds of entrepreneurs how to successfully run their own business by serving the needs of millions of Americans seeking a friendly, helpful alternative to traditional banks. The United chain consists of over 140 check cashing centers operating in dozens of states across the country. Our typical check is a payroll, government or business check providing our customers with the cash they need to manage their busy lives. But United is about more than just cashing checks. Our centers help people manage their money on a simple cash basis. United customers prefer to pay as they go, often using cash to pay bills, pre-pay for typical credit-based services and only pay fees for the services that they actually use. United Check Cashing offers a warm, community bank-like atmosphere for customers to conduct their business. Our customers have unique demands not currently met by traditional banking institutions, so we have assembled a full compliment of products and services to meet your needs. United also offers better hours and more accessible locations than a typical bank. We’ll cash your check with no holds for just pennies on the dollar. We can also provide resources for you to pay your bills, wire money and other financial-based transactions.